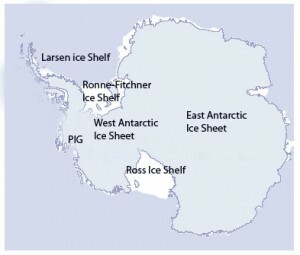 Pine Island Glacier (PIG) ice shelf is the floating extension of the Pine Island Glacier, one of the two largest outlet glaciers (Thwaites Glacier is the other) draining the West Antarctic ice sheet into the Amundsen Sea. Together, these two glaciers drain roughly one-third of the West Antarctic ice sheet, a volume of ice equivalent to raising global sea level one meter. 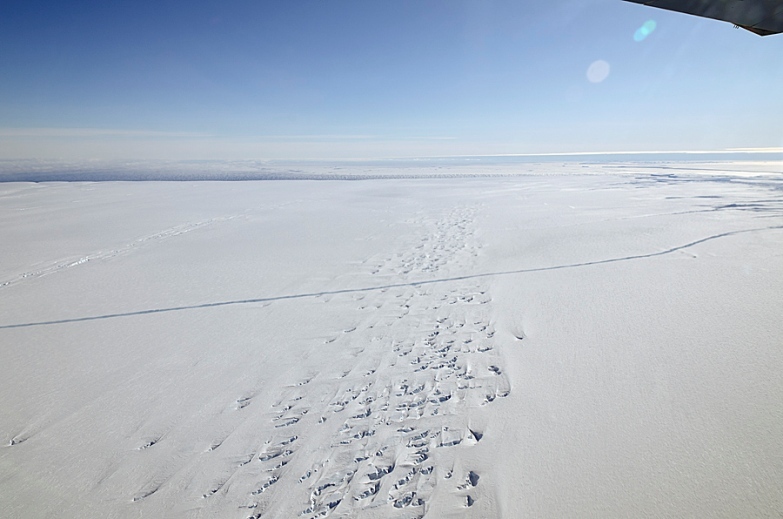 The ice shelf is approximately 40 km long and 20 km wide. PUNTA ARENAS, CHILE November 1, 2011 – After discovering an emerging crack that cuts across the floating ice shelf of Pine Island Glacier in Antarctica, NASA's Operation IceBridge has flown a follow-up mission and made the first-ever detailed airborne measurements of a major iceberg calving in progress. NASA's Operation Ice Bridge, the largest airborne survey of Earth's polar ice ever flown, is in the midst of its third field campaign from Punta Arenas, Chile. The six-year mission will yield an unprecedented three-dimensional view of Arctic and Antarctic ice sheets, ice shelves and sea ice. Pine Island Glacier last calved a significant iceberg in 2001, and some scientists have speculated recently that it was primed to calve again. But until an Oct. 14 IceBridge flight of NASA's DC-8, no one had seen any evidence of the ice shelf beginning to break apart. Since then, a more detailed look back at satellite imagery seems to show the first signs of the crack in early October. While Pine Island has scientists' attention because it is both big and unstable – scientists call it the largest source of uncertainty in global sea level rise projections – the calving underway now is part of a natural process for a glacier that terminates in open water. Gravity pulls the ice in the glacier westward along Antarctica's Hudson Mountains toward the Amundsen Sea. A floating tongue of ice reaches out 30 miles into the Amundsen beyond the grounding line, the below-sea-level point where the ice shelf locks onto the continental bedrock. As ice pushes toward the sea from the interior, inevitably the ice shelf will crack and send a large iceberg free. "We are actually now witnessing how it happens and it’s very exciting for us," said IceBridge project scientist Michael Studinger, Goddard Space Flight Center, Greenbelt, Md. "It’s part of a natural process but it’s pretty exciting to be here and actually observe it while it happens. To my knowledge, no one has flown a lidar instrument over an actively developing rift such as this." Veteran DC-8 pilot Bill Brockett first flew the day's designed mission, crisscrossing the flow of the glacier near the grounding line to gather data on its elevation, topography and thickness. When it came time to investigate the crack, Brockett flew across it before turning to fly along the rift by sight. The ATM makes its precision topography maps with a laser than scans 360 degrees 20 times per second, while firing 3,000 laser pulses per second. When flying at an altitude of 3,000 feet, as during this flight, it measures a swath of the surface about 1,500 feet wide. As the crack measured at more than 800 feet wide in places, it was important for Brockett to hold tight over the crevasse. "The pilots did a really nice job of keeping the aircraft and our ATM scan swath pretty much centered over the rift as you flew from one end to the other," said Jim Yungel, who leads the ATM team out of NASA's Wallops Island Flight Facility in Virginia. "It was a real challenge to be told…we’re going to attempt to fly along it and let’s see if your lidar systems can map that crack and can map the bottom of the crack. "And it was a lot of fun on a personal level to see if something that you built over the years can actually do a job like that. So, yeah, I enjoyed it. I really enjoyed seeing the results being produced." While the ATM provided the most detailed measurements of the topography of the rift, other instruments onboard the DC-8 also captured unique aspects. The Digital Mapping System, a nadir-view camera, gathered high-definition close-ups of the craggy split. On the flight perpendicular to the crack, the McCORDS radar also measured its depth and the thickness of the ice shelf in that region. Catching the rift in action required a bit of luck, but is also testimony to the science benefit of consistent, repeated trips and the flexibility of a manned mission in the field. "A lot of times when you’re in science, you don’t get a chance to catch the big stories as they happen because you’re not there at the right place at the right time," said John Sonntag, Instrument Team Lead for Operation IceBridge, based at Goddard Space Flight Center. "But this time we were."